Editor’s Note: Many scenes feature large flashing lights, bright vibrating colors and shaking accompanied by screeching and whining of metal and several scenes feature a multidimensional portal that opens with clusters of neon colored blocks and bubbles that swirl; such sequences may affect viewers that are susceptible to photosensitive epilepsy or other photo sensitivities. – A man and a woman kiss briefly in two scenes. ► A young man says three times that he is in puberty because his pants seem too short. A man says he loved his wife, but they were divorced. A man says that seahorses mate for life. A pig character says, “I sing, I dance, I do it in my pants” (it is unclear what the reference implies and we see nothing). We see a flash of a pair of short pants with a bulge in it, but it is unclear what is happening. ► Five superheroes of human, pig, and robot species wear skin-tight suits that accentuate various body curves. One scene includes half a dozen women wearing strapless long dresses that reveal bare shoulders but no cleavage. A teen boy and a man appear shirtless in separate scenes for a few seconds. - A nuclear collider appears four times with flames bursting from two large cannons into each other, shaking the building that contains them. Nuclear bursts cause smoke clouds and clusters of sparks that explode to fill the screen with smoke and glowing embers. ► A blurry flashback shows a man with a tickle of blood from one nostril punching a much smaller man in the head; the first man punches the second man, who is now below the frame and says, "Get rid of the body," and we later hear that the second man died. In a flashback, a man sees his wife and young son leave and the scene cuts to them driving away in a car and crashing loudly off-screen (we hear that they died). We see dead men in two scenes (no blood is seen and both upper bodies look a little scorched). A man punches a teen boy several times in succession, causing the teen to fall, but without injury. ► A huge ogre with a long forked red tongue, horns, scales, feathers and wings chases a man several times and the two characters exchange kicks and punches; the man escapes to a rooftop and jumps off, supported by spider webbing, to catch a young man that has fallen and a big metal bolt hits the ogre in the head, knocking it out. An anvil falls onto the head of a man dressed to resemble a scorpion (no damage is done). Scientists fire rays of light from assault rifles at heroes, chasing them into the woods where the heroes swing through trees on webbing, while a woman with four long tentacles snatches at them and tries to choke them, and trees fall in several places with a little noise; a female hero punches away the tentacled woman and we see two male heroes hanging from trees in their own webbing. A man wearing metal claws and a mask chases a young man and loses him until he searches an apartment later and sees the heat signature of the young man, who is invisible; the two fistfight and the man chases the teen through the streets on a motorcycle with screeching tires until the teen jumps across rooftops to escape. A team of villains breaks into a house and finds a team of heroes where the teams fight each other with punches, kicks and throws, filling the screen with thrown bodies as they grunt and groan and walls shake on impact (no injuries are visible); characters fall through a broken wall, a man with claws chases a teen boy onto a roof and holds him over the edge until a villain shoots the claw man in the back (the teen carries the injured man inside and lays him down, where he dies without blood) and the teen cries and later a police officer cries about the dead man. In a cemetery at night a teen boy throws a bolt of electricity through a man, knocking him out; the teen picks up the man and runs through streets, using webbing to swing from buildings and they argue later chasing each other up and down a short fire escape. In multidimensional space, a woman wearing armor with tentacles chases a teen boy who turns invisible; she chokes a man and the invisible teen punches her in the face several times, then several other heroes punch the woman all at once, and a passing object smashes her to a point off-screen (presumably dead). 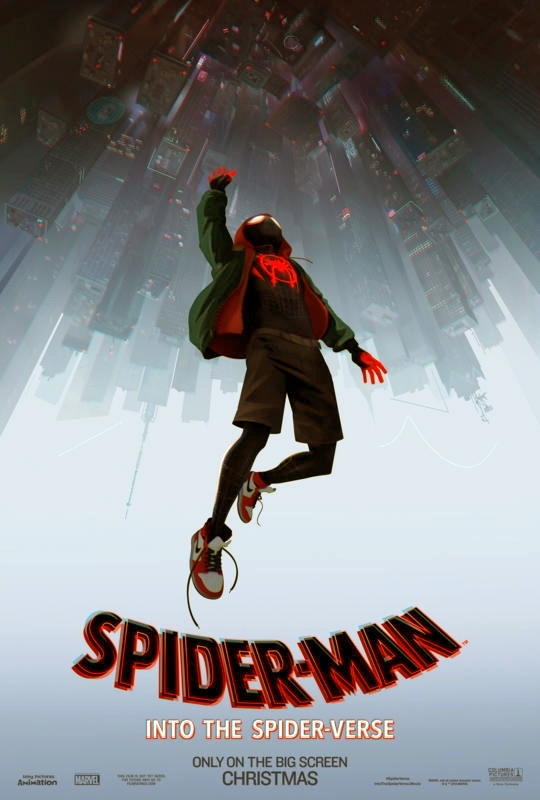 ► A teen boy fights a huge villain, who throws a taxi at him, but misses; hundreds of small glass panels on what looks like a building on its side shatter with some tinkling as the villain and teen enter a translucent subway car and fistfight and the teen smashes into walls and falls on his face, he gets up slowly and he and the villain fall onto a large collapsing bridge as the teen sends electric power through the villain, blowing him off-screen (we see him with a trickle of blood from one nostril, his body suspended by spider webbing between two skyscrapers as he scowls). ► A man ties a teen boy into a chair with many strands of spider webbing and the boy uses bolts of electricity from his body to break the webbing. A teen boy ties a man to a heavy punching bag with ropes. A teen boy smashes things loudly in his room. A teen boy punches a heavy bag. ► Three characters suffer radioactive spider bites on the back of one hand (we see the spider jaws bite to create a red spot on the hands); the characters pulsate with electrical bolts and one character smacks the spider, it falls and dies, and the character returns to find it again, touches it, and is shocked by electricity (he is uninjured). A few close-ups of the spiders feature glowing eyes, hairy mouth parts, and blue-tipped feet. A robot loses power, collapses, and a glowing spider scurries out and onto the shoulder of a little girl. ► Several characters use spider webs extruded from wrist devices to swing from buildings, over cars, across rooftops, on flagpoles, through hallways, up and down walls, and around rooms. A young man falls in or out of a window a couple of times and lands on a floor or pavement but is unhurt. A young man's hands and feet stick to a wall, a ceiling, papers, and a girl's hair; he and the girl struggle and he ends up with some hair stuck to his fingers, she throws him over her head as she rolls backwards, but neither one is injured. A young man sticks to a large fluorescent light. When a young man relaxes, he does not stick to anything but becomes invisible. A young man who witnesses some of the Spider-Man activities faints and falls out of his chair, unharmed. ► A man says about a character, "Kill that guy." A young man shouts, "We're all gonna die!" A man says, "Most people try to kill me in the workplace." A woman tells a man strapped to a large chair that his body will disintegrate (it does not). Several characters speak about losing a friend to death. We see a bullet miss hitting a man in slow motion. A man and a teen boy argue twice. A man, a woman, and a teenager argue briefly. A teenager argues with a man for several seconds. A man wearing a superhero costume sits in an empty bathtub and cries. ► Scientists add a hair to a vial of liquid and feed it into a nuclear collider that creates images of a woman and boy and they appear in a translucent subway car in the sky but then disappear. - A character sits at a counter that could be a bar while a voiceover says he is drinking an egg cream. - Families, mentors, secrets, danger, murder, death, loss, grief, revenge, sacrifice, having a calling, doing the right thing, friendship, relationships, love, commitment, starting over. - The world needs more everyday heroes.